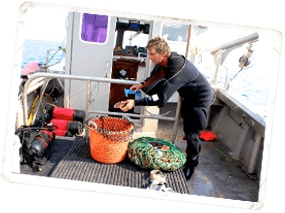 One of our aims at the Lyme Bay Fisheries and Conservation Reserve is to help fishermen achieve top pricing for their catch. To do this we have created the 'Reserve Seafood' brand, which markets the sustainable, premium quality, provenance-assured seafood of Lyme Bay. 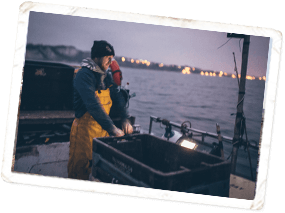 This premium product is a result of the fishermen's dedication to catch quality, whereby each fisher is signed up to the Lyme Bay Fisheries and Conservation Reserve and is accredited by the Seafish Responsible Fishing Scheme, which assures catch quality and fishing standards. The voluntary Codes of Conduct that each fisherman adheres to and the science which measures the results of fishing efforts in the Bay informs the sustainability of the product. Each vessel is also fitted with iVMS (inshore Vessel Monitoring System), which guarantees the traceability of each catch. All of this goes a long way towards the long-term sustainable future of Lyme Bay for both fish and fishermen. 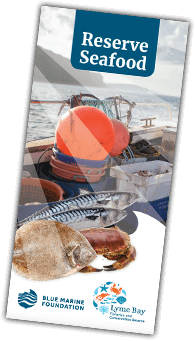 29 species of seafood were sold through Reserve Seafood in 2017 with top species including; crab, lobster, pollack, turbot and dover sole. 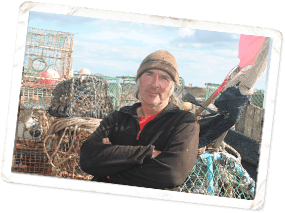 "As I fish exclusively within the Lyme Bay Reserve, I think that having a Reserve Seafood brand that explains the development and understanding of the fishing activities within the Reserve can only benefit fishermen in the long-term by making people understand the low-impact, sustainable way that we fish within the Reserve". "Why buy Reserve Seafood? Well firstly it’s sustainable. The Reserve is carefully managed by the Lyme Bay Fisheries and Conservation Reserve to ensure the stocks harvested are to a sustainable level. Secondly all the boats that fish the Reserve are predominantly day boats, which fish from small communities along the coast. This ensures the catch is super fresh. Thirdly by buying Reserve Seafood you are helping to keep traditional fishing villages alive and prosperous for future generations".